The advertising blitz is being fueled by a flood of campaign cash pouring into the 45th District state Senate race. That Eastside contest is expected to determine which party controls the state Senate. Cable TV ads in a high-stakes Eastside state Senate race claim Democratic candidate Manka Dhingra mismanaged a nonprofit organization and suggest the veteran prosecutor isn’t earning her salary. The GOP-associated political-action committee (PAC) Working Families pulled one of the ads this week following a complaint by state Democrats, according to a Comcast email that was provided by the Washington Senate Democratic Campaign. But Mark Lamb, an attorney representing Working Families, said Friday the ad wasn’t pulled because of the complaint. The ad had already been scheduled to come off the air, Lamb said, adding that it will be back on TV soon. A second ad, also paid for by Working Families, has drawn complaints for questioning Dhingra’s work ethic as an employee of the King County Prosecuting Attorney’s Office. The advertising blitz is being fueled by a flood of campaign cash pouring into the 45th Legislative District, which includes Duvall, Woodinville and parts of Redmond and Kirkland. Outside political committees reported more than $500,000 in new spending just this week, most of it from groups opposing Dhingra. The contest is expected to be the most expensive state legislative race in Washington history, and determine which party controls the state Senate. As of Friday, candidates and outside political groups had raised or spent about $3 million on the race, according to state records. 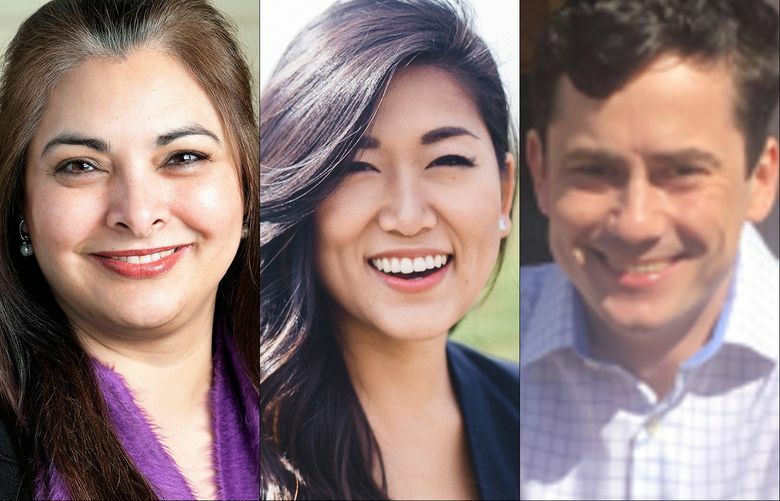 Dhingra faces Republican Jinyoung Lee Englund and independent candidate Parker Harris in the Aug. 1 primary. Dhingra and Englund are expected to advance to the November general election. An attorney representing the Washington State Democratic Party contacted Comcast this week with a complaint about one of the ads, said Adam Bartz, executive director of the Washington Senate Democratic Campaign. Jeff Davis, who is listed in state records as the treasurer and contact person for Working Families, did not respond to calls or emails seeking comment. Working Families is funded by The Leadership Council, a Republican-affiliated PAC. The TV ad appears to question Dhingra’s role as a board member at NAMI Eastside, a nonprofit organization that advocates on behalf of people who are mentally ill.
NAMI Eastside registered as a nonprofit with the Secretary of State’s Office in 2001 and didn’t register with the state Department of Revenue until 2005, according to state records. The ad also claims — accurately — that Dhingra didn’t vote in almost half of recent elections. In the past eight most recent elections, Dhingra missed voting in three primaries, Bartz said. After three years working full time at the King County Prosecuting Attorney’s Office, Dhingra in 2003 moved to a part-time role. But she took a corresponding pay cut, according to a letter released by the Prosecutor’s Office. Her boss, Mark Larson, chief deputy of the criminal division, said Dhingra — a salaried employee — routinely works more hours than for which she is paid. The part-time schedule, Larson added, allowed Dhingra flexibility to have more time with her family. She has been on leave since June. That ad also claims that Dhingra was paid by taxpayers for the time she spent traveling to Washington, D.C., for a campaign fundraiser. Dhingra used vacation time for that trip, Bartz wrote in an email. An attorney for the state Democrats has also sent Comcast a letter asking for that ad to be taken down, according to Bartz. Information in this article, originally published July 28, 2017, was changed July 28, 2017, to add a comment from Mark Lamb, an attorney representing Working Families, about why one of the ads was no longer being aired.